Click one of the alphabetical indexes above and you will be taken to the relevent page. For me one of the many pleasures of collecting David Winter Cottages is to discover the whereabouts of the mouse or owl that David sculpts onto his work. The first time that the mouse appeared was on "Brookside Hamlet". 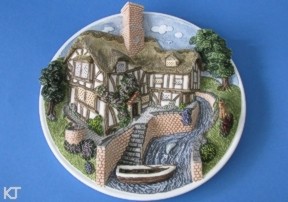 The story goes that in 1982 David was sculpting away, adding the finishing touches to this piece while another artist, who was working for John Hine Limited at the time, had just completed a model of a mouse sitting on a piece of cheese. 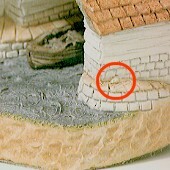 David Winter commented that he thought it looked more like a rat and sculpted a small mouse on the side of "Brookside Hamlet" to make his point. He then proceeded to add the mouse onto many of his sculptures thereafter and so the mouse was born. Very little else has been revealed about the reasons for this little rodent and the mouse has never been talked about officially even to the point that it even exists! During the period when John Hine Studios produced David's work their stock reply to questioning was "Mouse! What Mouse?". Collectors have therefore been left to discover the secret for themselves. The only acknowledgement of its possible existence was "Squeak!!!" a supplement to the Guild Magazine "Cottage Country" which ran for 12 issues from 1991 to 1993. 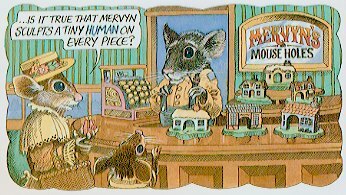 There was also The Great Mouse Hunt competition in "Cottage Country" which was held in 1991 where the prize was an 18 carat mouse sculptured by David's sister Alice Winter. 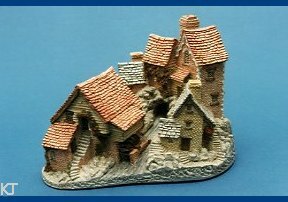 There has also been a number of miniature Christmas ornaments depicting various mice including "What Cottage" - a mouse holding a small cottage. Then at the end of 1991 it was suddenly realised that the mouse had disappeared (it was last seen on "Castle in the Air") and that an owl had taken its place. The owl is even trickier to find than its predecessor as it is mainly hiding in bushes and ivy. Because of this it is more prone to being painted over and so can become lost amongst the foliage. 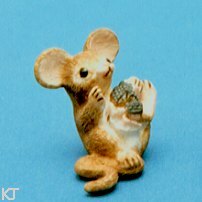 However, when collectors discovered what had happened to the mouse they were appalled at the loss of their old friend and petitioned John Hine Studios for its return. Realising the mouse's popularity the mouse returned two years later and he can be seen again on the 1993 Collectors Guild plaque "On the Riverbank" with the owl flying away. David is not the first artist to use a mouse as a secret trademark. It is well known that artist Terence Cuneo signs his world famous railway paintings with a tiny mouse. If this is all news to you and you have an overwhelming urge to go hunting with a magnifying glass I can recommend "Brookside Hamlet" as the piece to start with as the first mouse is the biggest and easiest to spot. The listings contained within these pages will, I hope, assist you in identifying the location of the mice, or owls, on your own pieces. It is not intended to spoil your fun so if you still want the joy of the hunt then do not look any further. However, you may find this list useful as it might save you long and frustrating hours looking for a non-existent mouse especially on one of the larger cottages. Also you may find it useful to know if you are meant to be looking for a mouse or an owl. Please note that every attempt has been made to make sure that all information contained in the above pages is accurate and up to date. Mouse and owl locations have been obtained mainly from my own observations. The remainder have been obtained from various sources. However, because of this there may be a small number of cottages which are marked with a question mark. This is because the location is currently unknown or I have obtained conflicting information.